The origin of the phrase ""the church has left the building"" lies with Elvis. In order to clear halls of his riotous fans after concerts, it was announced that ""Elvis has left the building."" Here, the expression highlights intense change within the church. Not only does the church change for its own existence, it also does so for the life of the world. The church cannot avoid the many past and future changes of our constantly transforming society, demographic changes long in process. What you have before you is a gathering of first-hand reflections--stories really--from a diverse group of Christians, lay as well as ordained. While each has a distinctive experience of the church in our time, all of them have something to say about the many changes in our society and how these are affecting our faith, the parish, and pastoral work. Contributors: Mary Breton Nicholas Denysenko Adam A. J. DeVille John C. Frazier David Frost Carol Fryer Kenneth J. Guest Brett Hoover Abbie Huff Wongee Joh Justin Mathews Maria Gwyn McDowell William C. Mills Robert Corin Morris Sarah Hinlicky Wilson Michael Plekon ""In The Church Has Left the Building, Michael Plekon compiles moving testimonies about what it means to depart from the structures that have held and sustained us. The voices in this book do not gloss over our situation with magical solutions or blind denial. Instead, they present real reflections of what it means to be church today. Through their honest grief, gratitude and liberation, they call out with a deeply hopeful vision."" --Carol Howard Merritt, author of Healing Spiritual Wounds; columnist and blogger for The Christian Century; senior consultant for the Center for Progressive Renewal ""Michael Plekon has in recent years brought to life a wide variety of extraordinary Christian figures, past and present, and thought through their witness in the light of his richly nuanced understanding of Orthodox theology and tradition. 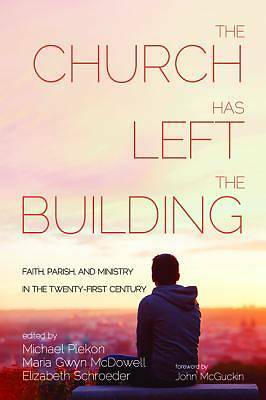 This new book is a sort of wake-up call to all who worry about the future of institutional Christianity: the Church as gift and mystery is a good deal more resilient than the various awkward structures in which it embodies itself, and we need a voice like Plekon's to remind us of this and to recall us to hopefulness."" --Rowan Williams, Master of Magdalene College, Cambridge Michael Plekon is a professor in the department of sociology and anthropology and the Program in Religion and Culture, Baruch College of the City University of New York. Maria Gwyn McDowell is a postulant for the priesthood in the Episcopal Church and a feminist theological ethicist. Elizabeth Schroeder is a homebirth midwife and editor in Portland, Oregon.